Very Good. Scene of the Crime: Who Killed Shelly Sinclair? (Harlequin Large Print Intrigue) by Cassidy, Carla, 2016-01-19. Mass market (rack) paperback. Glued binding. 288 p. Harlequin Large Print Intrigue, 1617. Very Good. Scene of the Crime: Who Killed Shelly Sinclair? (Harlequin Intrigue) by Cassidy, Carla. Mass market (rack) paperback. Glued binding. 224 p. Harlequin Intrigue, 1617. Good. Scene of the Crime: Who Killed Shelly Sinclair? (Harlequin Intrigue) by Cassidy, Carla. Mass market (rack) paperback. Glued binding. 224 p. Harlequin Intrigue, 1617. Fine. 0373698844 Ships from Tennessee, usually the same or next day. 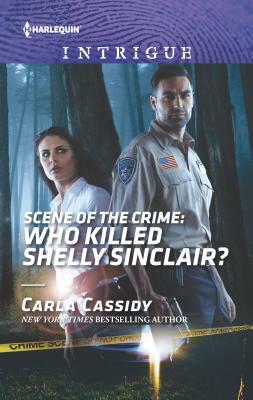 All Editions of Scene of the Crime: Who Killed Shelly Sinclair?